A kitchen is undeniably the hub of any home, with families spending more time there than in any other room in the house. 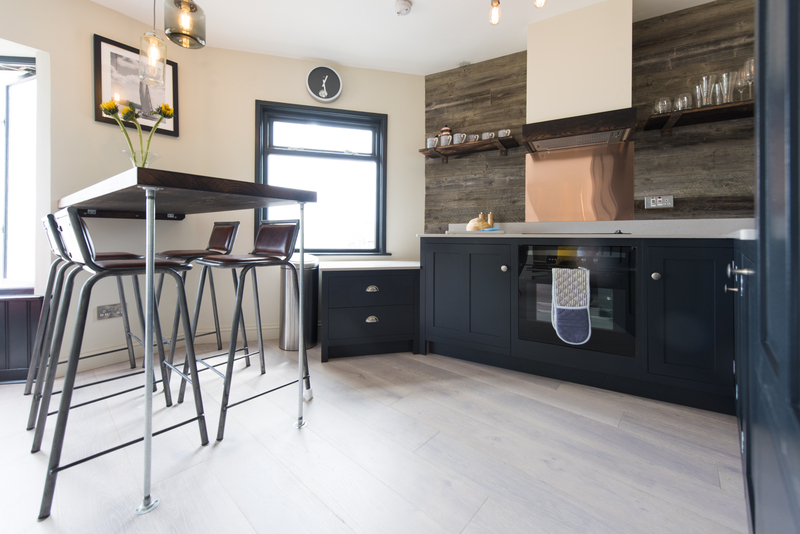 Furthermore, it seems that the kitchen is one of the most important aspects of any house for potential purchasers too, with experts suggesting that you could add between 4 – 7 % extra value onto your home by updating your kitchen before trying to sell. Frankly, if a show stopping kitchen can help to tip the balance for prospective purchasers then, if you have the budget, it may be well worth investing the cash and making your home irresistible! The key to achieving success will depend greatly on prioritising features which will appeal to lots of people rather than creating a dream kitchen just for you. 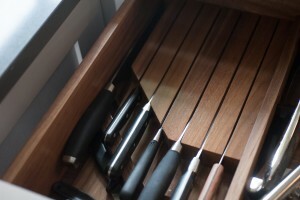 Choose quality materials particularly for cabinet doors and drawers. Opt for features such as soft close drawers and doors. Classic hard-wear has higher mass appeal rather than personal stylised preferences. Art-Deco may be your absolute favourite but this doesn’t necessary apply to everyone. Colour choice – Check out current trends but generally aim towards a mainly neutral palette, (dark hues are also bang on trend right now). Colour can be introduced via accessories which are easily changeable. High quality is an absolute must. Appliances which are not integral should be finished in matching metallic, or coordinated with a colour, rather than white. Hot water taps are energy efficient and produce less wastage. Pyrolytic self-cleaning ovens have massive appeal for the keen cook who hates cleaning. 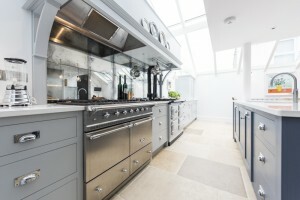 Similarly, Induction hobs are now more popular than the old favourite, the gas hob, simply because they are more ergonomic, efficient and easy to clean. A funky cooker hood will catch the eye and there are lots of great on-trend options to choose from. Select good quality flooring that will have instant visual impact on prospective viewers. There are masses of choice but opting for a natural stone floor, such as limestone, will create a timeless and warm looking environment. 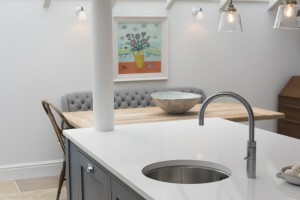 Where possible get expert advice on lighting from your kitchen supplier. It is so easy to make a mistake and create the wrong atmosphere. Make sure you discuss ambient under cabinet and plinth lighting as well as ceiling options. Consider breaking up a large area with an island – they work well as both cooking and entertaining spaces. Choose different surface materials to delineate the areas. Make the entertaining area slightly higher than the cooking and preparation areas. Break up the expanse of the island with cooking or washing up components. Ensure the entertaining area is a safe distance from hobs or hot taps. If you have space why not consider a breakfast nook for cosy dining and entertaining. A circular seating area will be more fluid for conversing and dining than sitting in a row where someone always ends up on the end! 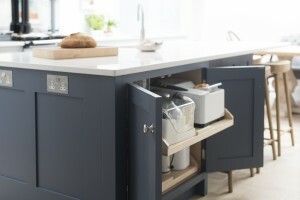 Add colour to your kitchen with matching accessories rather than having too much colour in blocks. Keep the work surfaces uncluttered – If items add nothing to the design then they should be kept out of sight in cupboards. Consider storage space with a charging facility for electrical gadgets like your laptops, tablets and phones to keep clutter and wires tucked away safely and out of sight. A show-stopping kitchen should easily capture the heart of any prospective viewers and will help to snag you a buyer quickly, easily and for the best price possible so that you are free to move on to your next project!